Innovative all-in-one™ zoom integrates state-of-the-art optical design, PZD (Piezo Drive)*1 and Tamron’s exclusive VC (Vibration Compensation)*2 system to achieve superb image quality in a remarkably compact, lightweight package. 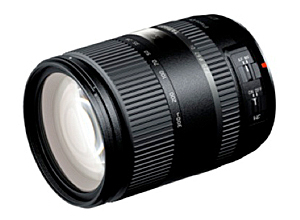 June 19, 2014, Saitama, Japan - Tamron Co., Ltd. (President & CEO: Morio Ono), a leading manufacturer of precision optics, has announced the release of 28-300mm F/3.5-6.3 Di VC PZD (Model A010), an advanced new all-in-one™ zoom lens for full-frame DSLR cameras. 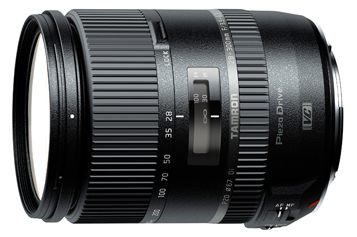 Having revolutionized the optical design of the previous 28-300mm (Model A20), Tamron is now launching a powerful new, high-power zoom lens for full-frame DSLR cameras that enhances image quality and incorporates the PZD (Piezo Drive)*1—a standing-wave ultrasonic motor system optimized for swift, quiet AF—and the acclaimed VC (Vibration Compensation)*2 mechanism in an amazingly compact configuration. On this date the Canon and Nikon mount models will be simultaneously launched worldwide. The launch date of the Sony compatible mount model will be announced at a later date. In addition to state-of-the-art optical design that facilitates downsizing of the lens body, the mechanical design, which incorporates a highly sophisticated multi-stack-cam layout that takes up far less space, and PZD (Piezo Drive)*1, an autofocus drive system with a simpler, more compact structure, has made it possible to reduce the overall dimensions of this lens compared to the existing Tamron 28-300mm (Model A20). 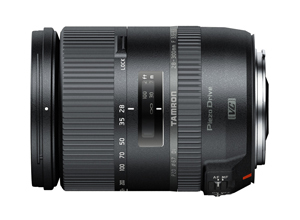 These technologies are the fruit of Tamron's more than 20 years of research and development in the high-power zoom lens field. The PZD (Piezo Drive)*1, a standing-wave ultrasonic motor system, delivers faster, quieter, more precise action when the autofocus is engaged. The full-time manual focus system is easy and intuitive, enabling quick and convenient manual focus at any time. Tamron’s acclaimed VC (Vibration Compensation)*2mechanism reduces image blur caused by camera shake to deliver significantly sharper images even when shooting handheld. *1 PZD (Piezo Drive) is a standing-wave type ultrasonic motor system developed by Tamron. It delivers outstanding speed and quiet operation in the AF mode. It also provides greater flexibility in design compared with ring-type ultrasonic motors, thus contributing to reduced lens size. 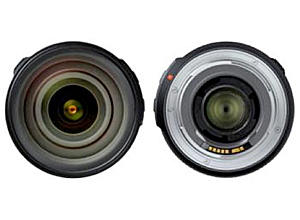 *2 VC (Vibration Compensation) is Tamron's proprietary tri-axial image stabilization mechanism. *3 The Sony mount model does not include VC, since the bodies of Sony DSLR cameras include built-in image stabilization functionality. 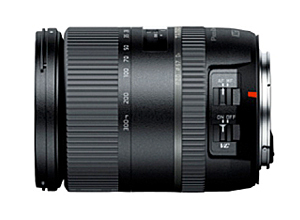 The name of the Sony mount model is "28-300mm F/3.5-6.3 Di PZD" without the VC designation. *Length and weight are based on figures for the Nikon mount model. Ultrasonic motors are classified into two types depending on how the energy used to move the drive is generated: traveling-wave motors and standing-wave motors. Traveling-wave motors include the ring-type ultrasonic motor that has been adopted for the SP 70-300mm F/4-5.6 VC USD (Model A005) and other lenses. On the other hand, the PZD (Piezo Drive) adopted for the 18-270mm F/3.5-6.3 VC PZD (Model B008), the 16-300mm F/3.5-6.3 VC PZD MACRO (Model B016) and the new Model A010 is classified as a standing-wave ultrasonic motor system. The standing-wave ultrasonic motor system utilizes ultrasonic-frequency voltage to extend and turn the piezoelectric (piezoceramic) element, which causes the entire element to vibrate in an "S" pattern known as a standing-wave motion. The vibration of the element generates an elliptic motion at the metal tip, which is attached to the tip of the element and in contact with the rotor. Friction of the metal tip with the rotor caused by this elliptic motion turns the rotor to focus the lens. Innovations to reduce parts and simplify operation also contributed to the lens's reduced size and weight.